^ 1.0 1.1 1.2 1.3 1.4 1.5 SIMBAD Astronomical Database. Results for NGC 1952. [2006-12-25]. ^ 2.0 2.1 Kaplan, D. L.; Chatterjee, S.; Gaensler, B. M.; Anderson, J. A Precise Proper Motion for the Crab Pulsar, and the Difficulty of Testing Spin-Kick Alignment for Young Neutron Stars. Astrophysical Journal. 2008, 677 (2): 1201. Bibcode:2008ApJ...677.1201K. arXiv:0801.1142. doi:10.1086/529026. ^ 3.0 3.1 3.2 3.3 Trimble, Virginia Louise. The Distance to the Crab Nebula and NP 0532. Publications of the Astronomical Society of the Pacific. 1973, 85 (507): 579. Bibcode:1973PASP...85..579T. doi:10.1086/129507. ^ 4.0 4.1 Carroll, Bradley W.; Ostlie, Dale A. An Introduction to Modern Astrophysics, Second Edition. [2012-01-20]. （原始内容存档于2012-01-25）. 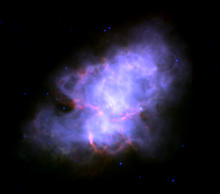 ^ Crab Nebula: The Spirit of Halloween Lives on as a Dead Star Creates Celestial Havoc. ^ 6.0 6.1 Erickson, W. C. The Radio-Wave Scattering Properties of the Solar Corona. Astrophysical Journal. 1964, 139: 1290. Bibcode:1964ApJ...139.1290E. doi:10.1086/147865. ^ Brecher, K., Lieber, E., & Lieber, A. E. Report of a Near Eastern Sighting of the Crab Supernova Explosion. Bulletin of the American Astronomical Society. 1978年3月, 10: P424 [2012-02-25]. ^ Glyn Jones, K. The Search for the Nebulae. Journal of the History of Astronomy. 1976, 7: P67. Bibcode:1976JHA.....7...67B. ^ Lundmark, K. Suspected New Stars Recorded in Old Chronicles and Among Recent Meridian Observations. Publications of the Astronomical Society of the Pacific. 1921, 33: P225. Bibcode:1921PASP...33..225L. doi:10.1086/123101. ^ 19.0 19.1 Mayall, N.U. 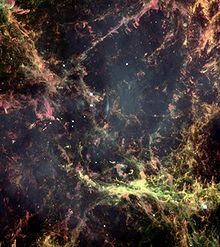 The Crab Nebula, a Probable Supernova. Astronomical Society of the Pacific Leaflets. 1939, 3: P145. Bibcode:1939ASPL....3..145M. ^ Collins, George W., II; Claspy, William P.; Martin, John C. A Reinterpretation of Historical References to the Supernova of A.D. 1054. Publications of the Astronomical Society of the Pacific. 1999, 111 (761): 871–880. Bibcode:1999PASP..111..871C. arXiv:astro-ph/9904285. doi:10.1086/316401. ^ Hester, J. Jeff. The Crab Nebula: an Astrophysical Chimera (PDF). Annual Review of Astronomy and Astrophysics. 2008, 46: 127–155. Bibcode:2008ARA&A..46..127H. doi:10.1146/annurev.astro.45.051806.110608. ^ Fesen, R. A.; Kirshner, R. P. The Crab Nebula. I - Spectrophotometry of the filaments. Astrophysical Journal. 1982, 258 (1): 1–10. Bibcode:1982ApJ...258....1F. doi:10.1086/160043. ^ Bietenholz, M. F.; Kronberg, P. P.; Hogg, D. E.; Wilson, A. S. The expansion of the Crab Nebula. Astrophysical Journal Letters. 1991, 373: L59–L62. Bibcode:1991ApJ...373L..59B. doi:10.1086/186051. ^ Animation showing expansion from 1973 to 2001. Astronomy Picture of the Day. NASA. [2010-03-20]. ^ Trimble, Virginia Louise. Motions and Structure of the Filamentary Envelope of the Crab Nebula. Astronomical Journal. 1968, 73: 535. Bibcode:1968AJ.....73..535T. doi:10.1086/110658. ^ Bejger, M.; Haensel, P. Accelerated expansion of the Crab Nebula and evaluation of its neutron-star parameters. Astronomy and Astrophysics. 2003, 405 (2): 747–751. Bibcode:2003A&A...405..747B. arXiv:astro-ph/0301071. doi:10.1051/0004-6361:20030642. ^ Green, D. A.; Tuffs, R. J.; Popescu, C. C. Far-infrared and submillimetre observations of the Crab nebula. Monthly Notices of the Royal Astronomical Society. 2004, 355 (4): 1315–1326. Bibcode:2004MNRAS.355.1315G. arXiv:astro-ph/0409469. doi:10.1111/j.1365-2966.2004.08414.x. ^ 28.0 28.1 Fesen, Robert A.; Shull, J. Michael; Hurford, Alan P. An Optical Study of the Circumstellar Environment Around the Crab Nebula. Astronomical Journal. 1997, 113: 354–363. Bibcode:1997AJ....113..354F. doi:10.1086/118258. ^ Shklovskii, Iosif. On the Nature of the Crab Nebula’s Optical Emission. Doklady Akademii Nauk SSSR. 1953, 90: 983. Bibcode:1957SvA.....1..690S. ^ Burn B.J. A synchrotron model for the continuum spectrum of the Crab Nebula. Monthly Notices of the Royal Astronomical Society. 1973, 165: P421. Bibcode:1973MNRAS.165..421B. ^ 彬彬. 蟹状星云伽马射线异常爆发 辐射强度提高两三倍. 科学网. 2010-12-13 [2010-12-15]. ^ Ron Cowen, Science News. Crab Nebula’s Violent Outbursts Shock Astronomers. WIRED SCIENCE. 2010-12-08 [2012-01-24]. ^ 蟹状星云中有宇宙粒子加速器. 科学网. 2008-08-29 [2012-01-25]. ^ 40.0 40.1 MacAlpine, Gordon M.; Ecklund, Tait C.; Lester, William R.; Vanderveer, Steven J.; Strolger, Louis-Gregory. A Spectroscopic Study of Nuclear Processing and the Production of Anomalously Strong Lines in the Crab Nebula. Astronomical Journal. 2007, 133 (1): 81–88. Bibcode:2007AJ....133...81M. arXiv:astro-ph/0609803. doi:10.1086/509504. ^ Minkowski, R. The Crab Nebula. Astrophysical Journal. 1942, 96: 199. Bibcode:1942ApJ....96..199M. doi:10.1086/144447. ^ Bolton, J. G.; Stanley, G. J.; Slee, O. B. Positions of three discrete sources of Galactic radio frequency radiation. Nature. 1949, 164 (4159): P101–102. Bibcode:1949Natur.164..101B. doi:10.1038/164101b0. ^ 43.0 43.1 Bowyer, S.; Byram, E. T.; Chubb, T. A.; Friedman, H. Lunar Occultation of X-ray Emission from the Crab Nebula. Science. 1964, 146 (3646): P912–917. Bibcode:1964Sci...146..912B. PMID 17777056. doi:10.1126/science.146.3646.912. ^ Haymes, R. C.; Ellis, D. V.; Fishman, G. J.; Kurfess, J. D.; Tucker, W. H. Observation of Gamma Radiation from the Crab Nebula. Astrophysical Journal Letters. 1968, 151: PL9. Bibcode:1968ApJ...151L...9H. doi:10.1086/180129. ^ Del Puerto, C. Pulsars In The Headlines. EAS Publications Series. 2005, 16: P115–119. doi:10.1051/eas:2005070. ^ Bejger, M.; Haensel, P. Moments of inertia for neutron and strange stars: Limits derived for the Crab pulsar. Astronomy and Astrophysics. 2002, 396 (3): P917–921. Bibcode:2002A&A...396..917B. arXiv:astro-ph/0209151. doi:10.1051/0004-6361:20021241. ^ Harnden, F. R.; Seward, F. D. Einstein observations of the Crab nebula pulsar. Astrophysical Journal. 1984, 283: P279–285. Bibcode:1984ApJ...283..279H. doi:10.1086/162304. ^ Kaufmann, W. J. Universe 4th. W. H. Freeman and Company. 1996: 428. ISBN 0-7167-2379-4. ^ Hester, J. J.; Scowen, P. A.; Sankrit, R.; Michel, F. C.; Graham, J. R.; Watson, A.; Gallagher, J. S. The Extremely Dynamic Structure of the Inner Crab Nebula. Bulletin of the American Astronomical Society. 1996, 28 (2): 950. Bibcode:1996BAAS...28..950H. ^ Nomoto, K. Evolutionary models of the Crab Nebula's progenitor. The Crab Nebula and related supernova remnants; Proceedings of the Workshop. Cambridge University Press. 1985: 97–113. Bibcode:1985cnrs.work...97N. ^ 51.0 51.1 Davidson, K.; Fesen, R. A. 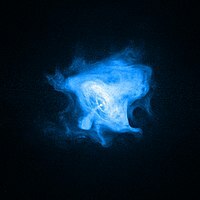 Recent developments concerning the Crab Nebula. Annual Review of Astronomy and Astrophysics. 1985, 23 (507): 119–146. Bibcode:1985ARA&A..23..119D. doi:10.1146/annurev.aa.23.090185.001003. ^ Frail, D. A.; Kassim, N. E.; Cornwell, T. J.; Goss, W. M. Does the Crab Have a Shell?. Astrophysical Journal Letters. 1995, 454 (2): PL129–L132. Bibcode:1995ApJ...454L.129F. arXiv:astro-ph/9509135. doi:10.1086/309794. ^ Palmieri, T. M.; Seward, F. D.; Toor, A.; van Flandern, T. C. Spatial distribution of X-rays in the Crab Nebula. Astrophysical Journal. 1975, 202: P494–497. Bibcode:1975ApJ...202..494P. doi:10.1086/153998. ^ van den Bergh, Sidney. A Jetlike Structure Associated with the Crab Nebula. Astrophysical Journal Letters. 1970, 160: L27. Bibcode:1970ApJ...160L..27V. doi:10.1086/180516.